A new solar power system installed on an Alcoa manufacturing facility in California -constructed, owned and operated by Constellation Energy Projects & Services-is raising the profile of renewable power in the industrial sector. This past summer, Alcoa Building and Construction Systems flipped the switch on its new $4 million, 588 kilowatt (kW), roof-mounted, photovoltaic solar power system at its Kawneer manufacturing facility in Visalia, California. The project also involved the installation of over 200 day lighting tubes to enhance lighting on the manufacturing floor without additional electricity consumption. The system, constructed, owned and operated by Constellation Energy Projects & Services (CEPS), creates a partnership between two corporate heavyweights-and will help raise the profile of renewable power a notch or two in the industrial sector, as well as show that the renewable energy industry is maturing. While Alcoa's Kawneer business has been involved with building integrated photovoltaic systems as early as 1984, this was the first solar power project at one of the company's own manufacturing facilities. Alcoa is the world's leading producer and manager of primary aluminum, fabricated aluminum and alumina facilities. CEPS is a subsidiary of Constellation Energy, North America's largest competitive provider of wholesale and retail power for business customers. It is also a major purchaser of renewable power. Alcoa is a well-established manufacturer of aluminum products and building structures around the world. But it is still looking for ways to improve its manufacturing operations and develop new markets for its products. Dave Schlendorf, Alcoa Building and Construction Systems president, says the principal motivation for Alcoa's participation in the Kawneer project was to treat it as a learning experience. The company is exploring if there is a business opportunity for Alcoa as a supplier to the green power industry in North America. Back in the 1970s, it had worked on the development of a vertical wind turbine solution. That particular project was eventually shut down as a cost cutting measure and because it wasn't achieving the success anticipated from a technical standpoint. But in Europe, the company's Kawneer subsidiary has been manufacturing roof-mounted solar systems for residences and industry for the past three years, and Schlendorf says it has been quite a lucrative business. "What we're trying to figure out now is should we get more deeply in this business and how should we go about doing that," he says. During periods of peak power demand in the summer, the solar project will provide up to 80 percent of the power required for Alcoa's 200,000 square foot Kawneer facility in Visalia. This will help reduce demand on California's power grid, and provide the facility with a reliable energy source. "It's been a very positive experience," says Schlendorf. "Brownouts are an issue during the summer in California, and if enough people follow our lead and do what we did, we are going to minimize the risk of brownouts for plants like ourselves. "Certainly, maximizing the potential for our plant to run on a completely uninterrupted basis from an electrical supply standpoint is pretty positive from our perspective." The photovoltaic system reduces the amount of power Kawneer purchases from its local utility. The system is also interconnected with the utility grid. This enables the system to export power when it generates more than Kawneer may need at any point in time, such as on a weekend. A metering system tracks the flow of power and ensures Kawneer gets credit for power sent to the grid. Alcoa is definitely interested in pursuing more rooftop solar power projects, says Schlendorf, provided two factors are in place. First, and obvious, the project must be in an area that receives a lot of sunlight and, second, there must be government incentives in place so that the project makes financial sense. The Visalia installation met both those criteria. To give an example of how much sunlight Visalia receives, Schlendorf recently had to meet outdoors with a large group of employees at Visalia-and they had to meet at 6:30 am because that was the only time of day when anyone could endure being outside for more than 20 minutes. Alcoa is giving consideration to duplicating its Visalia rooftop solar power installation experience at other locations in the United States and Europe. And it has lots of company in that interest in solar power. CEPS president Greg Jarosinski says interest in renewable power is booming among the company's commercial, industrial, and institutional clients and the potential for similar projects like the Kawneer facility is significant. "There's a lot of roof space out there," he says. "I don't think it's a fad. I think it's something that will continue and be around for a long time. We're serious about the business and that's why we're taking ownership positions in solar projects, where a lot of other companies aren't." The company has owned and operated renewable power facilities for about seven years, and Jarosinski says negotiating long-term power purchase agreements (PPAs) helps to build long-term relationships with customers. 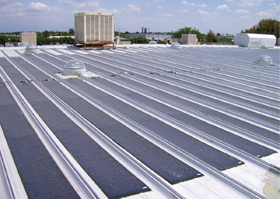 Shortly after the Alcoa roof-mounted system came on line, CEPS announced that it had signed an agreement with General Motors Corporation (GMC) to construct a solar power system that will generate 870 kWs of power and supply nearly half the power requirements for GMC's 300,000 square foot service and parts operations warehouse in Fontana, California. CEPS will also own and operate that installation. In general, the company aims for projects that generate a minimum of 200 kWs from solar power, but would consider smaller projects if it served the needs of an existing customer. The Kawneer project featured the installation of 4,300 lightweight UNI-SOLAR thin-film photovoltaic laminates produced by United Solar Ovonic. No major structural reinforcement was required on the roof because of the lightweight solar energy collection material used. Given its reputation as an experienced energy advisor and green energy provider for the past 20 years to a wide array of clients including the United States government, CEPS has actually evolved into an important green power project expediter on an industrial scale. For example, the Kawneer project was initiated by DEERS, a global solar power project developer and owner of the DEERS solution, a patent pending solar rooftop attachment system. CEPS was invited to join the project as the builder, owner and operator because it could finance the project in a hurry, taking advantage of state rebates that were about to expire. As an expediter and owner, with experience in a variety of alternative energy areas, including geothermal, biomass, landfill methane, and now solar, CEPS has developed a large network of equipment suppliers. The Kawneer project features the installation of 4,300 lightweight UNI-SOLAR thin-film photovoltaic laminates produced by United Solar Ovonic, a wholly-owned subsidiary of Energy Conversion Devices Inc. Based in Auburn Hills, Michigan, United Solar Ovonic is the world's largest manufacturer of thin-film solar products, holding 335 U.S. and 590 foreign patents. Construction of the Kawneer solar power system took five months. No major structural reinforcement was required on the roof because of the lightweight solar energy collection material used. The use of photovoltaic laminates meant that there were no heavy and breakable glass elements in the Kawneer project. "That's one of the reasons we used the UNI-SOLAR product rather than a crystalline product, because the roof really doesn't have the structure to support the crystalline product." says Schlendorf. "By using the UNI-SOLAR product, it wasn't an issue." 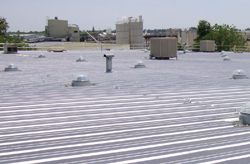 Because of the 20-year commitment being made by Alcoa to purchase solar power from the CEPS system, the roof was recoated and resealed. As a safety consideration, a guardrail around the roof and stairs leading up to the rooftop system were also installed. Project manager Ron Melchoir says CEPS was able to modify and tie into the plant's switch gear without disrupting production, as most of this tie-in work was done on weekends or late at night. Since coming on line in August 2007, the system has been operating at between 110 and 120 percent of expectations. Both CEPS and United Solar Ovonic will again partner on the General Motors solar power project. Given its supplier contacts, CEPS is able to customize its green power solutions for its customers, and through ownership, save clients the headache of having to operate their own alternative energy systems. "We take all the risk on the entire installation and operation of the systems," says Jarosinski. "It saves clients from having to put up the capital and it locks in the rate over a long period of time." What's particularly beneficial about solar power is that it is producing maximum power during the hottest part of the day, which is also the point of peak demand and energy prices on the power grid. Both Alcoa and CEPS emphasized the importance of the availability of subsidies or rebates to companies investing in alternative energy projects; this make them economically viable in the near term until prices reach grid parity. CEPS has about six major solar installation projects underway throughout the U.S., in locations where subsidies are in place or there is a lucrative market for the sale of renewable energy certificates (RECs) generated by the installation of a renewable power facility. At present, rebates are buying down solar power installations anywhere between 30 and 50 percent, according to Mark Lonkevych, CEPS vice-president of marketing and strategy. "The thinking is that over the next several years, solar power will become more of a mainstream product as prices come down for materials because that is the costliest component today," he says. CEPS has a number of solar, biomass, landfill gas and geothermal power generation projects in the pipeline. "Everything we do is green," concludes Jarosinski. "Where we are in this place and time is a pretty good fit because there is so much customer interest."